The National Pubwatch Awards have been established to encourage and recognise the work of local Pubwatch schemes throughout the United Kingdom and their efforts to provide safe drinking environments for customers and staff. We are pleased to announce that this years award is being sponsored by JD Wetherspoon. We believe that Pubwatch schemes make a real contribution to the safety of people working and socialising in the night time economy. 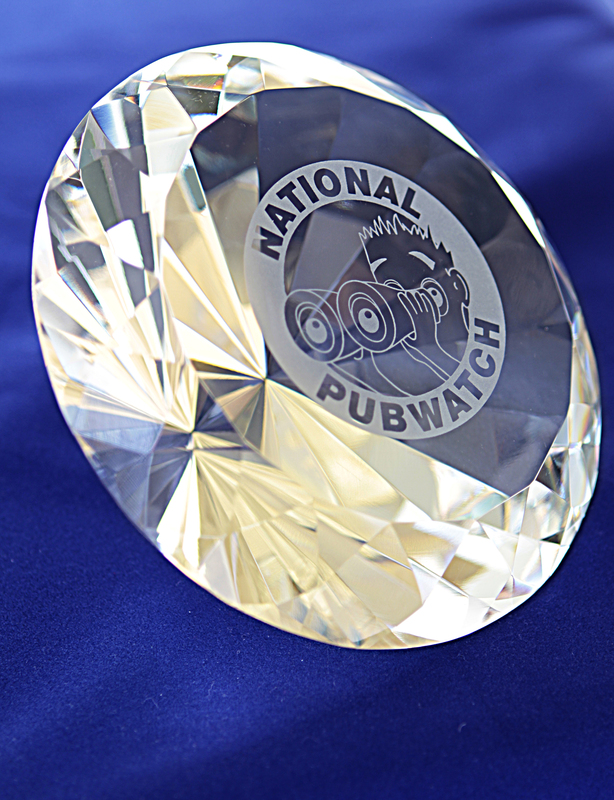 The National Pubwatch award gives your Watch the opportunity to be recognised as a good practice scheme and to help publicise and promote the Pubwatch movement. Entries are welcomed not only from the members of a Pubwatch but also anyone wishing to nominate a scheme on their behalf, with their express consent. The only stipulation is that your scheme is registered on the NPW mapping tool. There is no cost to register with us. Please note that there is an expectation that applicants are able to attend the award ceremony. We are not in a position to fund travel and overnight accommodation. That the scheme has clear and stated aims and objectives for why it was established and how it will function. That the licensee members ‘own’ their scheme and they understand and work to the spirit of the National Good Practice Guide. That it can evidence how the members have promoted social responsibility through the schemes day to day work and innovation. The application process will open in April 2019. Final dates for applications to reach NPW is Friday 30 August 2019 – but please do not leave to the last minute. Finalists will be invited to attend a prestigious awards dinner in House of Lords on Wednesday 16 October 2019. The Pubwatch scheme, Chelmsford City, has been awarded the prestigious Diageo National Pubwatch Award for its significant role working in partnership to reduce violence and NTE crime in the city by 45%. The scheme was also commended for its work to reduce the use of fake ID and allay fears about acid attacks by distributing ‘acid attack’ kits to member premises. At a packed ceremony in the House of Lords last night (23/10/18), attended by MPs, Lords and notable names from the pub industry, Chelmsford City Pubwatch was crowned winner of the Diageo National Pubwatch Awards for 2018. “Partnership organisations like Pubwatch make a real difference to local communities and it is brilliant to see so many schemes getting involved and making an impact through this year’s Awards programme. I was hugely impressed by the work undertaken by Chelmsford City that has had such a positive impact in reducing crime amongst member organisations’ premises. I also want to congratulate Chester and Wrexham for their outstanding work”. Now in its seventh year, the National Pubwatch Awards, champion the work of local Pubwatch schemes throughout the UK and their efforts to provide safe drinking environments for customers and staff in all licensed premises. Entrants are judged by a panel of National Pubwatch Committee members and industry experts who identify the scheme which made the greatest contribution to its community. Each local Pubwatch works in partnership with local police to reduce alcohol-related crime, while providing local pubs with information and guidance on how to ensure a safe drinking environment in their community. The Chelmsford scheme was described by the local Chief Superintendent as ‘without question the stand-out Pubwatch team’. In particular it was recognised for the work it has done on drug searching and seizures – having utilised a drug safe provided by Essex Police in order to meet legal obligations. This has led to a significant increase in drugs seizures in the area. Also recognised as ‘highly commended’ at the awards were the Chester Pubwatch, which was lauded for its training and safeguarding work, and Wrexham Pubwatch, which the judges congratulated for the ‘Drink Less, Enjoy More’ campaign which focussed on refusing to serve drunks and training for door staff in the area to help them identify and protect vulnerable individuals. The Romford Town Pubwatch scheme, has been awarded the prestigious Diageo National Pubwatch Award for its significant role in working in partnership with other organisations to halve the number of crimes in licensed premises, tackling anti-social behaviour. At a packed ceremony in the House of Commons last night (2/11/17), attended by MPs, Lords and notable names from the pub industry, Romford Town Pubwatch was crowned winner of the Diageo National Pubwatch Awards for 2017. “Partnership organisations like Pubwatch make a real difference to local communities and it is brilliant to see so many schemes getting involved and making an impact through this year’s Awards programme. I was hugely impressed by the work undertaken by Romford Town that has had such a positive impact in reducing crime in their members premises. I also want to congratulate Plymouth and Windsor for their outstanding work”. Now in its sixth year, the Diageo National Pubwatch Awards, champion the work of local Pubwatch schemes throughout the UK and their efforts to provide safe drinking environments for customers and staff in all licensed premises. Entrants are judged by a panel of National Pubwatch Committee members and industry experts who identify the scheme which made the greatest contribution to its community. Romford Town Pubwatch’s submission received praise across the board by the judges for reducing the number of crimes committed at Pubwatch member venues by over half (56%) in the last year. The judges sought to highlight the scheme’s holistic approach. This included initiatives such as the use of ID scanning machines and online messaging for members to better communicate and administer its banning scheme, while also working closely with local police, medics and funding local street pastors. Romford Town Pubwatch is a relatively new scheme, established to empower local licensees within the busy night time economy to have a unified and independent voice. Also recognised through receiving ‘highly commended’ honours at the awards were the Plymouth Pubwatch, which was lauded for its collaborative approach to tackling alcohol-related crime across member venues, and Windsor Pubwatch, which the judges congratulated for the training it has provided to its member venues. Local Pubwatch scheme is presented with the national award for role in the reduction of alcohol-related crime across the region, and its commitment to partnership working, both with statutory agencies and voluntary organisations such as Street Pastors. 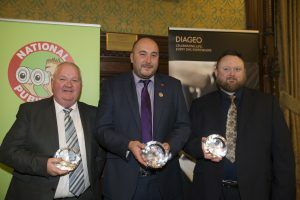 Penzance and Newlyn was crowned as the winner of the Diageo National Pubwatch Award at a packed ceremony in the House of Commons last night, with MPs, Lords and notable names from the pub industry in attendance. The National Pubwatch Awards, sponsored by Diageo GB, encourage and recognise the work of local Pubwatch schemes throughout the UK and their efforts to provide safe drinking environments for customers and staff. 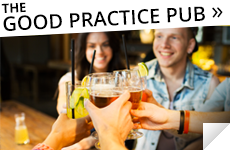 Each local organisation works closely with local police to reduce alcohol related crime, and provides local pubs with information and guidance on how to create safer drinking environments. Now in its fifth year, the entrants were judged by a panel of National Pubwatch Committee members and industry experts. 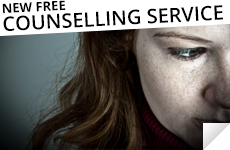 The Penzance and Newlyn Watch was praised by judges for its outstanding ‘early intervention’ approach, including working with vulnerable people and substance abusers to identify problems before they become an issue. The Watch was also commended for establishing an exceptional range of partnerships with the likes of Trading Standards and Addaction, a drug and alcohol treatment charity. Judges were also particularly impressed by the Watch’s support of a ‘safe places’ scheme, providing places of sanctuary within pubs for people who may feel vulnerable when they’re out socialising in the pub. Mark Baird, Head of Alcohol in Society at Diageo Great Britain, commented: “Penzance and Newlyn represents all that is good about the National Pubwatch scheme and the work that its local organisations do. They play a critical role in reducing crime, promoting responsible drinking and making pubs a safe and enjoyable place for customers and staff. “Pubs play such an important role in our society, bringing people together and maintaining strong social bonds. They give local people a sense of togetherness, which is more important than ever in a world where interaction increasingly happens online. Everyone, no matter who they are, should feel safe when they go out for a drink at the pub, or for a meal. 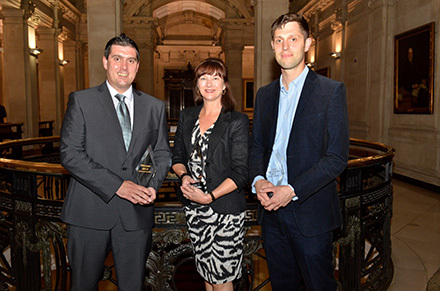 Durham was crowned as the winner of the Diageo National Pubwatch Award at a packed ceremony in the House of Commons on 22 October 2015, with MPs, Lords and notable names from the pub industry and other stakeholders in attendance. The annual award, now in its fourth year, showcases the work that local PubWatch schemes do throughout the UK to help create safer drinking environments. 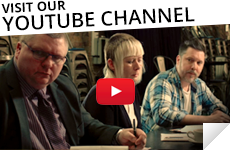 Entrants are judged by a panel of National PubWatch Committee members and industry experts, who identify the scheme which made the greatest contribution to its community. The Durham PubWatch’s submission was aided by glowing endorsements from local police about the work done to promote the Best Bar None award scheme, which was created to promote the responsible management and operation of licensed premises. The Durham Watch ‘stepped well beyond the expectations of a normal scheme’, according to the judges, who were struck by its ability to work successfully in close partnership with Durham City authorities. That work includes initiatives to help train licensees, bar staff, and door staff on best practice, and clampdown on violent and disorderly incidents at licensed establishments, which has contributed to a 15% drop in alcohol-related anti-social behaviour in the city over the past year. The judges were particularly impressed by the Watch’s involvement in the City Safety Group scheme to improve public safety around rivers, particularly for those under the influence of alcohol. Various new initiatives have been introduced in pubs and clubs in the city, and volunteer wardens now patrol the city’s river banks to help those at risk. The measures are a response to a number of tragic deaths in the city centre since 2013, with three university students drowning since 2013. 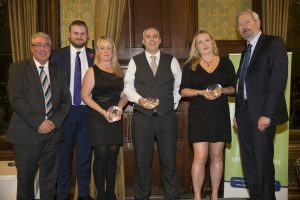 Speaking at the awards Steve Baker, Chairman of National PubWatch, said: “I would like to congratulate this year’s winners Durham PubWatch scheme, and our highly commended schemes, Glasgow City and Consett & District for the work they do. 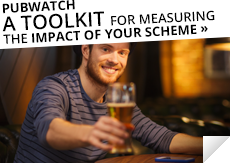 These schemes provide ample evidence PubWatch plays a vitally important role in keeping the pubs and bars and the wider public areas of our towns and cities a safer place to work and socialise. 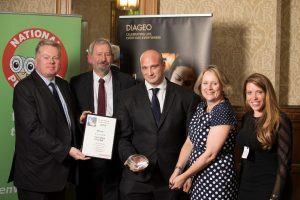 I would also like to warmly thank Diageo for supporting our work and providing such a wonderful opportunity for local PubWatch schemes to demonstrate their good practice and to receive acknowledgment from the wider industry”. 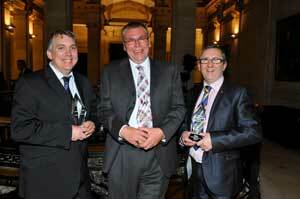 Two other Pubwatch schemes, in Glasgow and Consett, were also shortlisted for the award. They were both acknowledged by judges for demonstrating an outstanding contribution to promoting social responsibility in their local areas. Droylsden’s Pubwatch wins national award for saying no to anti-social behaviour and barring local criminals, to create an enjoyable and safe atmosphere for the local community. 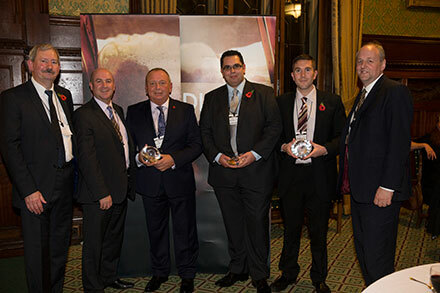 Droylsden’s Pubwatch receives the Diageo National Pubwatch Award 2014 in front of MP’s and some of the most influential members of Britain’s pub industry at a ceremony in Westminster. 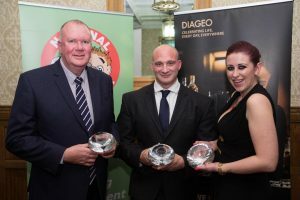 The award is the result of the efforts of Diageo and National Pubwatch to recognise the work of local Pubwatch schemes throughout the United Kingdom. Most notably, their efforts to provide safe drinking environments for customers and staff. Droylsden’s Pubwatch was established in 2012 following a gangland shooting in a local pub, which ultimately led to the murder of two young female police officers in the area. Police responded strongly to the unusual circumstances by issuing a closure order for all pubs and restaurants in the area in an effort to tackle crime and anti-social behaviour. To show their collective support, the area’s 30 pubs and restaurants agreed to band together to issue known criminals with lifetime bans from all licensed premises. Despite threats and violence, the pubs and pub owners have remained dedicated to the cause. They have implemented a ‘call around’ policy which involves pubs calling other pubs to alert them to any anti-social behaviour and they proudly demonstrate their commitment to the scheme with their distinctive Pubwatch posters and bar staff wearing a special Droylsden Pubwatch t-shirt. Speaking on the success of the awards, Mark Baird, Head of Alcohol in Society at Diageo Great Britain, commented ” At Diageo Great Britain we are proud of the success of the Pubwatch Award; over the past three years it has grown from strength to strength. The Droylsden case in particular exemplifies how partnership schemes like Pubwatch make a real difference to local communities. We are committed to supporting the on-trade sector and want to congratulate Droylsden for showcasing how business can come together so brilliantly”. Steve Baker, Chairman of National Pubwatch, said “Thanks to Diageo we have been able to acknowledge the wonderful work of local Pubwatch schemes throughout the UK via this award. We offer our congratulations to this year’s winners Droylsden and our Highly Commended schemes Hereford and Westminster. I hope these great examples inspire others to look at what they can achieve within their own communities”. From left to right: Steve Baker-Chair NPW, Andrew Cowan-CEO Diageo GB, Alan Graham-Droylsden Pubwatch, Dan Guerche-Hereford Against Night Time Disorder (HAND), Karl Rogers-Westminster South Licensed Premises Group, Lord Rupert Redesdale. 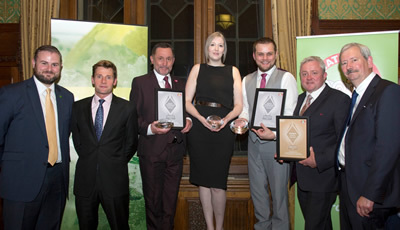 On 10 July 2013 the Diageo National Pubwatch Awards 2013 were presented at the Annual All-Party Parliamentary Beer Awards Dinner with the Blackpool Pubwatch scheme scooping the top prize. The scheme’s impressive range of responsible drinking initiatives and clear commitment to working with partners throughout the local community was applauded by the judges. 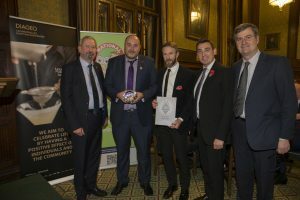 On 16 May 2012, At the Annual All-Party Parliamentary Beer Awards Dinner, the first ever NPW Award was presented to the Northampton Pubwatch Scheme. The schemes impressive range of responsible drinking initiatives and clear commitment to partnership working was singled out by the judges. Also recognised as ‘highly commended’ at the awards celebration were finalist schemes Chester and Aylesbury Pubwatch; commended by the judges for demonstrating an outstanding contribution to promoting social responsibility in their local areas. 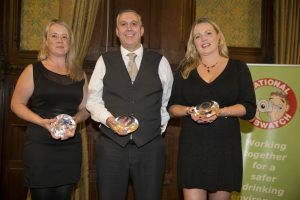 Martijn Van Buuren On-Trade Channel Director for Diageo GB; presented all three finalists with their awards, which were judged by a panel of National Pubwatch Committee members and industry experts. Steve Baker, Chairman of National Pubwatch said “We are delighted with the number and quality of entrants received for this awards launch. The National Pubwatch Award acknowledges the fantastic work and great practice undertaken by local Pubwatch Schemes across the UK and their efforts to improve safety for all”. Pubwatch, and Frank Marnell Chester Pubwatch.